Rates: Basic make-up, £200. Advanced level, £900. Add ons: £450. Hello. I'm Sunita Johal of Crimson Catz. 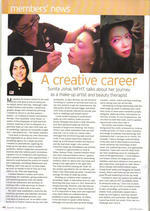 I'm a complementary/holistic and beauty therapist and professional make-up artist with 25+ years experience under my belt. I have a vast amount of experience and current knowledge in this field and have worked on many national and international catwalks and behind the scenes with major brands during my career. I have recently been recognised for my years in the health, beauty and make-up industry by F.H.T for my work, inspiring others and recently featured in International Therapist magazine along with many other publications. Crimson Catz have also been on various radio stations as experts in our field. They include: Bang FM, London, Heart FM, BBC Three Counties Radio and Tropical FM. Crimson Catz have been accepted by the International Institute of Complementary Therapists as APPROVED TRAINING PROVIDERS. The courses are open to anyone looking for a new addition to their career skill set and to also achieve the best through advanced techniques using a 'high end' cosmetic range including Supercover, Illamasqua, NYX and more. The 'safe beauty' methods are also used whilst applying make-up. The basic make-up course is for one day only and costs £200 This will lead to the F.H.T accredited professional advanced level make-up course; yes this is a recognised qualification. The professional advanced make-up course costs £900 and will consist of four intensive days training and will look at other aspects of the industry, including business. Please see the table below for course content. Upon successful completion you will gain a certificate of achievement for the basic make-up course and a diploma for the professional advanced level make-up course. Both courses are based in Luton, Bedfordshire, UK. The maximum number of learners to a class is 6, to ensure everyone gets the attention they need. We also cater for anyone looking to only learn one or two areas, for example fashion (1 day) or Asian/Western bridal (1 day). We call these 'add-ons' and cost £450. Please contact us to discuss your specific needs. Payment: A non refundable deposit (50%) of the course fee will confirm your place on the course that you wish to attend. The final balance needs to be paid a week prior to the course start date. We do not advertise set training dates, but tailor our dates around your needs and availability. We will confirm suitable dates when we discuss your requirements. Use of gold leaf, gems, glitter etc. As mentioned above, I'm a health and beauty therapist and professional make-up artist with 16+ years experience under my belt. I have a vast amount of experience and knowledge in this field and have worked on many national and international catwalks (London and Milan)and behind the scenes with major brands during my career. I have recently been recognised for my years in the health, beauty and make-up industry by F.H.T for my work, inspiring others and recently featured in International Therapist magazine along with many other publications. Crimson Catz have also been on various radio stations as experts in our field. They include: Bang FM, London, Heart FM, Three Counties Radio and Tropical FM. Crimson Catz have been accepted by the International Institute of Complementary Therapists as APPROVED TRAINING PROVIDERS and our advanced make-up course is accredited by the F.H.T. In 2010 I passed my PTLLS course which gave me the right to be able to do what I love, and that's to teach basic and advanced make-up. I had to ensure that all of my paperwork for the advanced course was ready for accreditation and this passed in May 2011. Since then, students from all walks of life and from all over the world have been through my door to learn basic/advanced make-up or even a one day 'add on'. Prior to gaining my beauty, holistic and make-up qualifications, I gained a HND in commercial printing and graphics, BTEC National Diploma in General art and design, specialising in Fashion & Textiles. As I said, I love teaching, I'm very patient and want YOU, my students to receive the best and be the best! There are no limits to where you can go with make-up. I've been there and done it. I've a whole load of experience behind me and this continues to grow. My other specialities include marketing, PR and business. This area is also covered on the advanced course, once you successfully gain your diploma, an adventure awaits. I also recommend that you keep in touch, so I can see your progress and if you have any questions, you can ask away. Get in touch, kind regards, Sunita Johal. You will need to supply your own model on all of the practical days, which is the entire course. Course costs may change, our website http://crimsoncatz.com is being updated, so do call for more information.